Basking in the full sun, even on hot days, many species can be seen enjoying their siesta, in different poses and also at different times of the day. We call it 'trancing' as they look like they are in a deep trance. 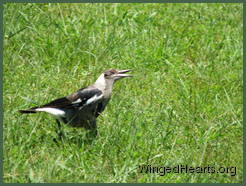 One of the favourite poses used by the magpies and noisy-miners, is to squat in a shallow dip on the ground and spread their wings out at full length. I think this gives them the chance to rest their legs and perhaps also rest the muscles that hold their wings open. 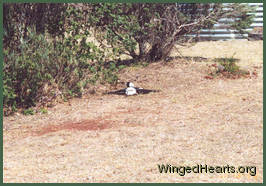 Cindy and Tammie our magpies liked resting against the bank and spreading their wings. The miners birds too like to fully spread their wings while basking. 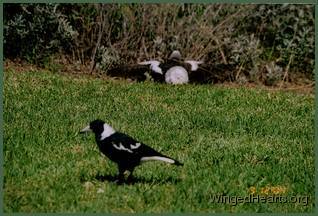 The first time I saw our magpies Cindy and Tammie in this position, I got a real fright. 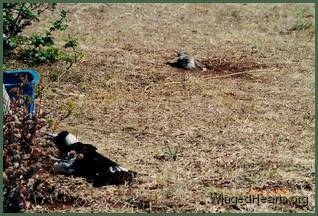 The looked quite lifeless and like they had been spread out in the sun to dry. I thought that had been injured or were ill. Then I saw them move their heads - they were semi-awake. 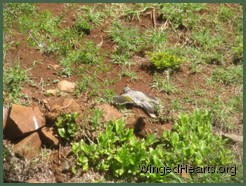 Wanting to make certain that they were not injured, unable to fly and in need of help, I walked up to them. Seeing me approach they got up, looking quite drowsy. Maggie came down from the trees where he had been keeping watch and playing the role of 'sentry' while the girls got their break. The girls flew into the trees, and I was quite pleased to see they were capable of rising out of the trance state and fly, even though their dopey look suggested that they were nor quite ready for chatter and chase. The noisy miners and butcherbirds also like to trance and we have also seen the bar-shouldered doves, crested pigeons and crows go in and out of trances. Our yard with no dogs or cats gives the birds a safe place for their sunbathing activities. Safety is a big issue for this activity as their reflexes are much slower. Sometimes their trances have lasted for over 15 minutes. There is always at least one bird on guard in the trees to warn them of approaching danger. And when the warning is issued, they are usually pretty quick in returning to the trees, much to my relief. A shallow dip in soft mud or a slope on the side of a bank seem to be favourite locations for a trance. 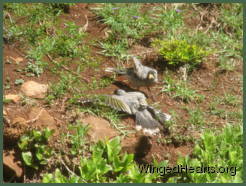 Minnie and our other noisy miners would land so excitedly near a small dip in the ground caused by the rain. Within seconds she would fall into a trance and stay there for almost five minutes. 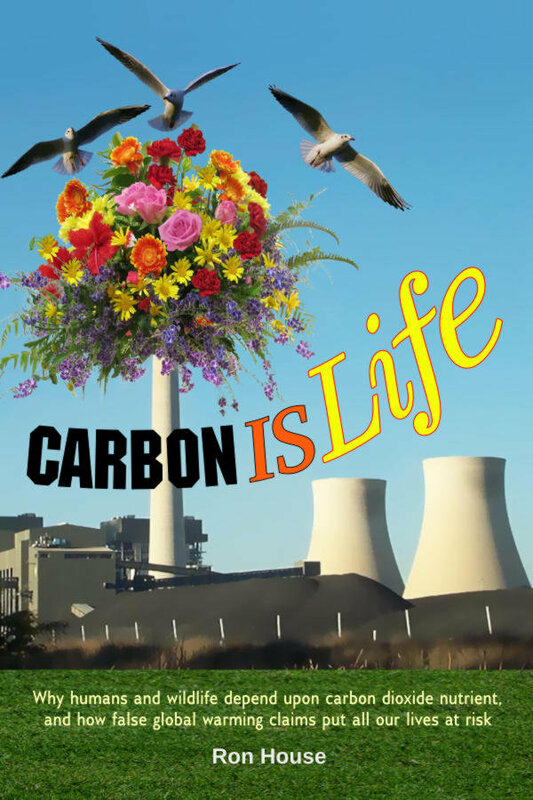 The magpies would trance beside them, or sometimes wait for them to vacate the spot. Other birds would wait for their turn. The pigeons tend to trance in a semi sitting position and be more alert throughout. I guess being small and more vulnerable, they tend to take shorter half-trances (my jargon) so their responses to warnings or sudden movements around them can be quicker, giving them a better chance to escape. As the birds got more confident and safer in our presence, we noticed their 'trancing patterns' as we call it. 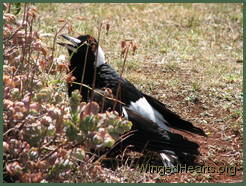 The magpies would always go into a full spread trance at the same time every morning. Later in the day, they would go into a half-trance, that is in a sitting position on the ground, with their head cocked onto one side and sometimes only one wing spread out. They really look so funny in this pose. At other times the birds have just gone into a trance while sitting. They relax their muscles and go off to sleep. They seem quite immoble at times. Below you can see Dimpy in a trance at the door and Sophie in a trance on the lawn. One second they are talking to us, the next they are going into a deep sleep almost as if they have no control over it. The need to trance is almost reflex, I feel. 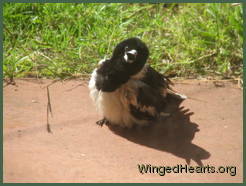 At times Maggie (male magpie) has just walked up to us and fallen into a trance at our feet almost. While Cindy and Tammie (his sisters) have joined him nearby, while Ron and I are standing talking. While we are careful not to make racket or frighten them by creating a lot of movement, they seem oblivious to our presence, treating us as part of their 'sentry' squad. On occasions we have even left our spot to go inside to get the camera and the birds have continued to stay in their trance trusting that they are safe around us. Other times Dimpy the butcherbird has eaten a small bit of food and gone into a trance right there beside it in the middle of the yard. The noisy miners, magpies and butcherbirds are quite happy to trance together on the bank. I have seen crows have their sunbath near the water bowls in mid afternoon. The timings seem to be more or less regular assuming there are no other activities requiring their attention. For example, if they are busy alerting the district about the eagles flying around or chasing hawks, or keeping an eye on passing planes, then sunbathing has to wait for a more opportune moment. Other events that affect the sun basking times are when visiting birds arrive, or juveniles and young adults are passing through their territory. On these occasions the birds tend to take shorter trances in a sitting or semi-spread position. Otherwise on a good quiet day, I have seen them sun bask in all three positions at different times of the day. Morning seems to be the full spread sun bathing time, while mid-morning seems to be the semi-spread basking time and late afternoons are sitting trance times. Interestingly I have also seen them trance on cloudy days and even in the shade. Though they all do appear to prefer the sunshine for this activity, I think this may also be the time for a quick nap, which would explain why they do it regardless of the weather. In the picture on the left below, Cindy and Minnie are in trance together. On the right young Kimbie is in a full trance while Mum Molly keeps watch.